Lucky Cloth Store a wholesale price shop in Vasco-da-Gama, South Goa, Goa. 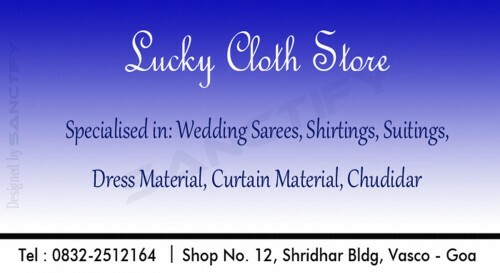 Lucky Cloth Store is specialised in Wedding Sarees, Suitings, Shirtings, Varieties of Dress Material, Chudidar, Curtain Material & Designer Sarees. School & College Uniforms are also available. Special rates are available for wedding purchase at Lucky Cloth Shop. Visit now to buy cloth at special price.